Scientific Program (November 1-4): aimed at a wide audience, including graduate students, mathematicians in other research areas, and scientists who use mathematics in an important way. 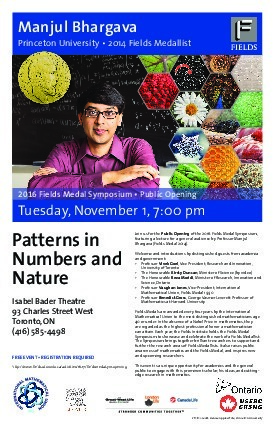 Public Opening (November 1): includes a lecture for a general audience by Manjul Bhargava followed by a reception. Student Night (November 2): geared towards high school and undergraduate students with a lecture by Manjul Bhargava followed by a networking reception. Pizza will be served. All events will be broadcast live online. The Public Opening is free to attend, but registration is required. See the sidebar to only register for the Public Opening and below to register for the other two events. REGISTER HERE for the Scientific Program. This link will also give you the option to register for the Public Opening and/or the Student Night. If you would like to attend the Student Night (but not the Scientific Program or Public Opening), please REGISTER HERE.